New to the fish keeping world and don’t know where to start? There are so many complex parts to a tank and too many veterans telling you how easy it all is. You don’t have to start off blind, nor do you have to try to do it all alone. Small aquarium kits give you a great starting point. If you’re new to the hobby and you want something low-maintenance, a 30-gallon aquarium kit is just right. Coralife’s 32-gallon aquarium kit builds on a rounded glass tank with black plastic accents. A smaller 16-gallon version is also available. The tank itself is full glass with black plastic covering the back then wrapping around and creating a base and lid. At the back, 3 separate chambers give you space out of plain sight for filters, heaters, and other accessories. The dimensions of the tank are 20 in. x 20.8 in. x 18.8 in. 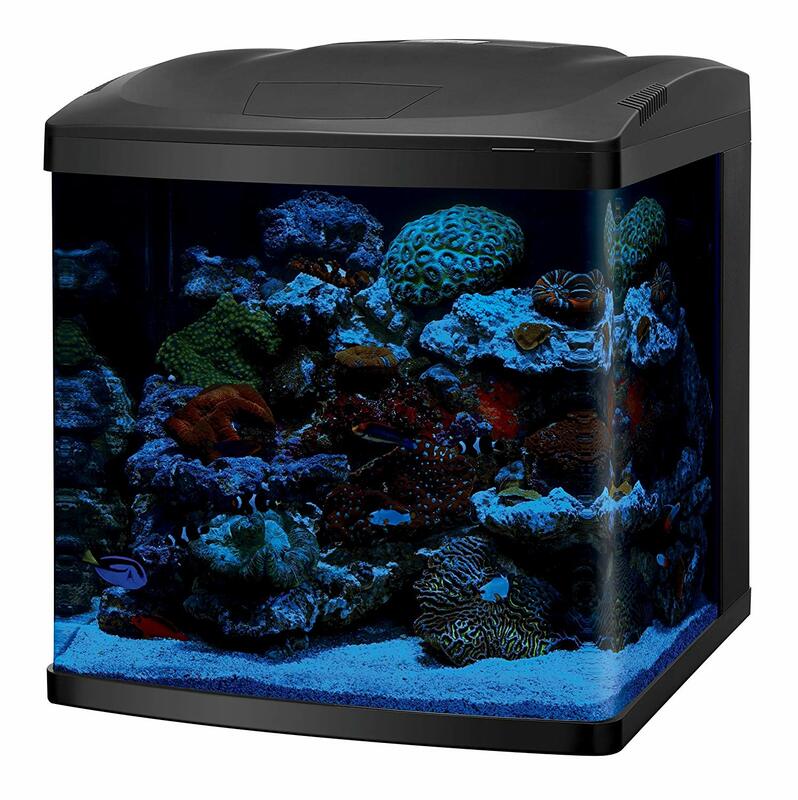 Coralife’s Biocube tank is intended for saltwater and reef tanks. Because of this, it has a coral-friendly LED light setup built into the lid. This light can add some heat to the tank as well. There is no heater included in the kit. Filtration is built into the convenient back chambers. Using a submersible pump, water moves into the back chambers for filtration before cycling back into the tank. The 32-gallon Biocube from Coralife is a good kit to start a saltwater or freshwater tank. With a built-in filter system and LED light rack, you only need a few small pieces for a complete setup. 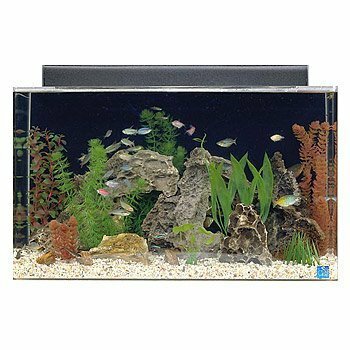 There are a variety of tank sizes available for the SeaClear acrylic aquarium combo set. This review will focus on the 29-gallon tank, but there are 15, 20, 26, 30, 40, 46, and 50-gallon sizes also available in various shapes. 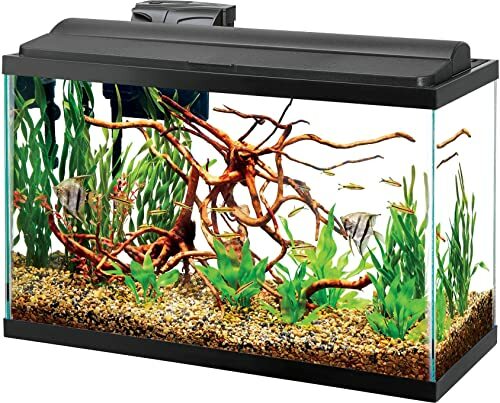 The 29-gallon tank is rectangular with clear edges and a black background. A light fixture sits on top and covers the center of the tank from above. The acrylic is fully transparent and easy to clean. With this kit, you’ll get the tank and light fixture only. There are gaps around the back of the tank, providing space for filters and heaters of your choice. The acrylic tank is lightweight and harder to chip or crack than glass. 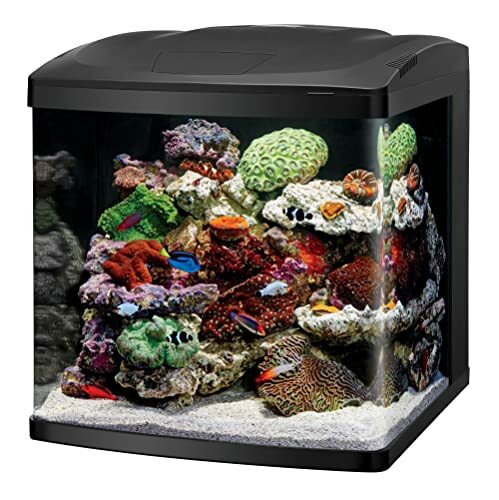 You can use this tank for saltwater or freshwater fish as you please. The dimensions of this tank are 30 in. x 12 in. x 18 in. 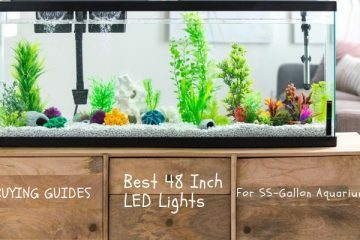 With all the different size and shape options, this aquarium kit gives you a lot of choices. It’s not perfect, but if you’re looking for an acrylic tank for saltwater or freshwater fish, it works well. Another 29-gallon setup, this kit from Aqua Culture gives you an attractive glass tank. The base and hood of the tank are made from black plastic and the back is clear. With this set, you’ll receive a hood with an LED light, a filter, a heater, and the tank itself. The LEDs are energy-efficient and designed to mimic the look of natural sunlight. The hood is also low-profile, adding to the modern aesthetic of the tank. For filtration, a Tetra brand internal cartridge filter comes with the tank. You will set the filter inside the tank with all the media it needs and allow it to operate completely underwater. Because it’s underwater, the filter will be inaudible from outside the tank. This tank is appropriate for freshwater and saltwater setups. It doesn’t have the right equipment for a reef tank. But, you could upgrade the systems yourself to turn it into a reef tank. With this set, you’ll get a good head start on your tank. You’ll provide the substrate, fish, and decoration, but you won’t need any filtration, heating, or lighting systems. As a slightly smaller choice, this 25-gallon Fluval accent glass aquarium makes for a great starter tank. It has clear glass walls with a thick espresso brown hood, matching brown base, and a brick pattern built-in filter in the center back. If you get this tank, you’ll have a great basic setup to build on. It comes with a built-in filtration system, energy-efficient LED lights, a hood, a pre-set heater, a water collection bucket, and the tank itself. The dimensions of the tank are 30 in. x 12.5 in. 18 in. Fluval’s SIMPLETEC filter in this tank has a unique design that makes it easier to clean. The one-touch cleaning system makes maintenance faster. A convenient lever on the tank removes one bucket of water every time it’s pressed. LEDs in the hood are adjustable for daylight or night mode. The pre-set heater helps maintain water temperatures for most freshwater fish. This is for freshwater use, but may be customizable for saltwater as well. Additional kit accessories include water conditioner, filtration media, filter cartridges, and biological enhancer. 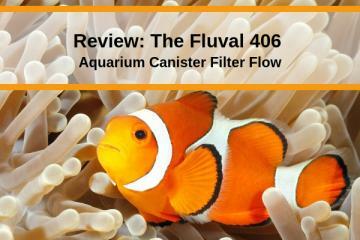 Fluval’s accent filter is well designed for interior spaces. It’s beautiful, different, and simpler to clean. If you’re looking for a low-maintenance option for a simple freshwater fish tank, this might be a good choice. 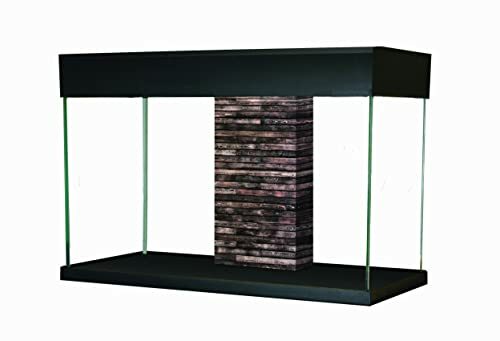 A pleasant rectangular tank, this Aqueon Deluxe LED aquarium kit is a 29-gallon option for decorating a smaller space. The tank is made from glass and has a small black hood and base. 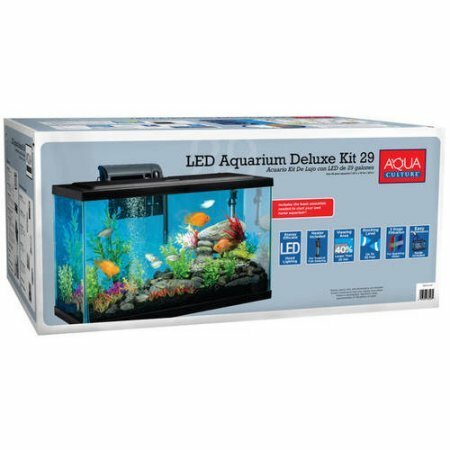 Included with this set, you’ll find an LED light system, a filter with cartridges, a preset heater, food samples from Aqueon, water conditioner, a fish net, a thermometer, and instructions. Once you have your substrate and fish, you can set the tank up immediately. This tank is tall and wide, with dimensions of 30.25 in. x 12.5 in. x 21.5 in. For filtration, the kit has a HOB filter using media cartridges. All the cartridges are available to purchase separately when the filter needs maintenance down the road. LEDs on the hood are removable. They’re set up to produce bright white light and do not have a secondary mode for nighttime. If you want a different light setup for your tank, you can change out the LEDs without having to replace the full hood. Anyone creating a freshwater planted tank can get good use out of this tank. It’s tall and skinny, making it easier to maintain with plants while still allowing the fish a nice space to swim. There’s a lot to look at in an aquarium kit. Smaller 25 – 30 gallon tank kits will usually come with a few basic pieces: tank, filter, light, and heater. Kits meant to accommodate saltwater or freshwater tanks will be different. For saltwater, you may not find a lot of tanks in this size range. 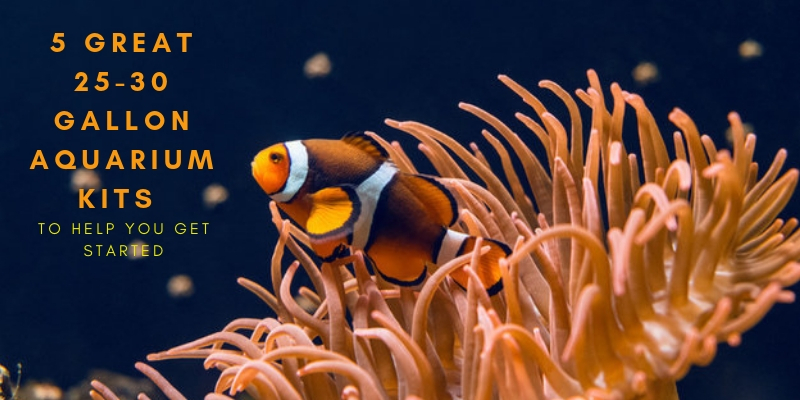 You can get nano reef tanks, but those are usually a little smaller and may need some specialized equipment. Most freshwater kits are fine in this size range. 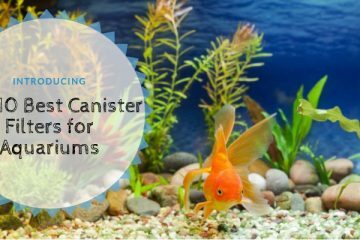 You will not have difficulty finding a complete, high-quality freshwater aquarium kit around 30 gallons. Most aquarium kits have hang-on-back (HOB) filters. They’re efficient for this size tank and come in a variety of strengths. Some kits may have under-gravel or submersible filters. It’s rare to get a small aquarium kit with a canister filter. Make sure that whatever filter is in the kit is strong enough for the tank. The filter must be rated properly for the tank size. Good filters turn over the entire tank’s water 2 – 3 times every hour. The most common type of heater is a submersible heater. These attach to the inside of the tank and regulate the water temperature. Submersible heaters work well in freshwater tank setups. Not all kits include lights. But, when they do, you want LED lights in a bright white color. For freshwater, the color and type of light don’t matter unless you’re growing plants. Planted tanks need LEDs that will mimic natural sunlight and stimulate growth. Similarly, nano reef tanks need very bright, specially colored LED lights for optimal growth. This is mostly down to personal preference. Acrylic tanks are resistant to chips and damage, but they scratch more easily than glass tanks. Glass is very scratch-resistant, but may chip over time. Both materials are fully transparent. Glass tanks tend to be more expensive than acrylic and may not come in as many styles. Over time, glass tanks tend to hold their transparency better as acrylic tanks scratch. Many 30-gallon aquarium kits entice you by including extra things in their kits. These are usually things you don’t really need. However, you can find some useful bits. 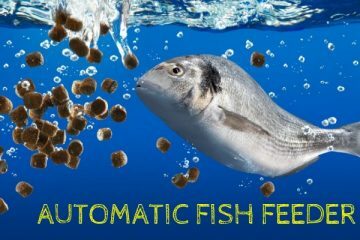 Fish food, water balancing chemicals, nets, decorations, and substrate are common extra kit accessories. You can find all of these things separately and easily. Don’t let these extras become the deciders for your final purchase. With the right 25 to 30-gallon tank kit, you can start your fish keeping hobby any time. 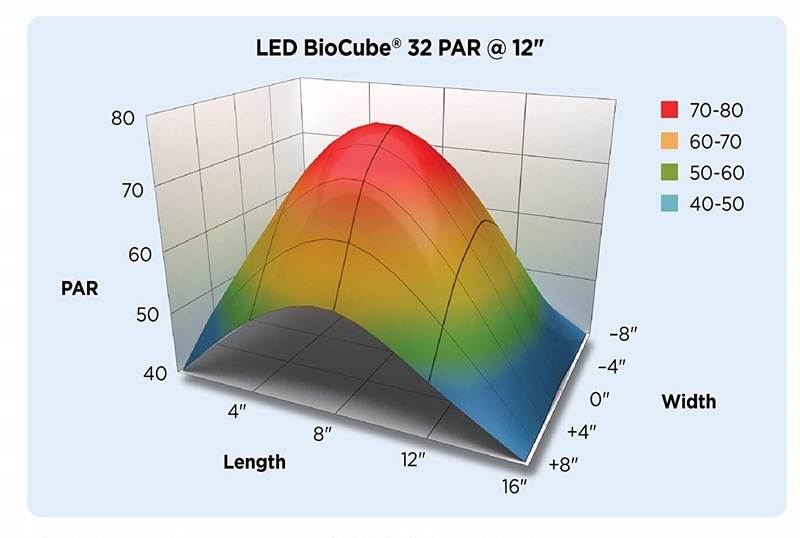 If you’re torn between saltwater and freshwater, get something like the Coralife LED Biocube 32-Gallon Aquarium that can easily be used for either. The 25-gallon Fluval Accent Glass Aquarium is a good all-inclusive kit that puts you in a great starting place. It’s got all the tricky pieces included, so all you have to worry about is the fun stuff like fish and plants. A tank kit makes it easier to get your new aquarium started. You’ll reduce the complexity of starting without getting rid of the fun of creating your own aquatic environment. The right tank kit makes all the difference.